Last year on my way down to San Diego, I had the pleasure of sitting beside Renegade Arts Entertainment founder- director, writer and editor Alexander Finbow. I can’t believe that this series is not getting more attention. Written by Canadian comics legend LOVERN KINDZIERSKI, with fully painted art by the astounding JOHN BOLTON and lettered by the esteemed TODD KLEIN. Shame is a Dark Fantasy Graphic Novel, Suggested for Mature Readers. The concept: When the purest woman on earth allows herself one selfish wish, it is enough to conceive the most evil woman the world has ever known. Shame: Conception introduces a world much like our own but with magick and those with the power to control it, for good and for evil. In the first tale we meet Shame, discover the unique circumstances of her creation, and follow her choices as her true nature is revealed. It is difficult to say more without giving away too much of the story, and it is a story of such scope and imagination that it would be seriously remiss of us to lessen your reading experience with spoiler now. The first issue just went to print and debuted at the Calgary Expo but the series was made available for order through Diamond MAY111180 / ISBN: 978-1-908217-01-1 and should be shipping to stores who ordered it on JULY 13 (next week). Writer Alan Grant’s epic adventure of a family caught up in the conflict that helped to define both Canada and America into the nations they would become. With the Bicentenary fast approaching Renegade will be publishing several books to commemorate the events. The 102 page comic book is being drawn by Claude St. Aubin, coloured by Lovern Kindzerski and lettered by Todd Klein. It will also feature a 30 page summary of the war written by well known Canadian historical author Mark Zuehlke. 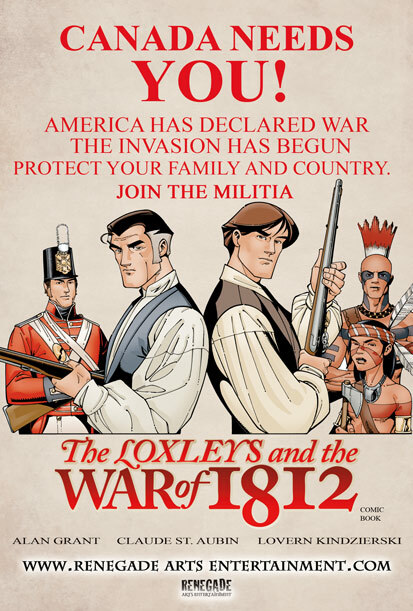 The Loxley’s left America after the American war of Independence to start a new life in the Niagara region of Canada, only to find themselves thrust back into the madness of war when America declared war against Britain and the Canadas. Adapted from Aurora Loxley’s journals, the story follows the family members involvement in the war and their challenges at home dealing with the chaos and violence of the time. The project will be accompanied by a number of interesting initiatives that we were given some information on but will share with you here on the blog when more information is made available. The project will premiere later this year and the preview art we were shown in Calgary looks fantastic! This entry was posted in 2011 Releases, Canadian Heroes, General Announcements, General News, Publishers, Retailers by Kevin A. Boyd. Bookmark the permalink.